Opossums are the only North American marsupials. The females of this group have a pouch on the belly where the young are carried and nourished for a time after their birth. Opossums are omnivores, and will eat almost anything, including insects, snails, rodents, berries, fruit, grasses, leaves, carrion, pet food, and garbage. They prefer meat to vegetables.Opossums are prolific breeders, and need places to live. Man made structures, such as the undersides of porches and sheds provide ideal habitat. Opossums can raid garbage cans and steal pet food. They can also carry parasites and diseases, although rabies incidents are much less frequent than in other animals, such as raccoons. Opossums are also the most common dead animal call that we get, because they don’t live long in the wild, and tend to die under homes and in attics. Opossums frequently take up residence in the attic of a home. Opossums are great climbers. They have opposable thumbs and prehensile tails, and can easily climb up to roofs of homes. There, they break in, often through an open eave gap area. 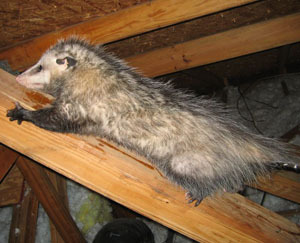 An attic is a warm, dry, safe place for an opossum to live. The most common time of year to find opossums in attics is during the spring, usually May or June, when a mother opossum has young. A very common problem is young opossums falling down the walls of homes and dying, which creates an awful odor in the whole house. In the attic itself, the animals not only create a lot of noise, they create a big mess, destroying insulation and defecating everywhere. One of the most common things that they do is crawl under an elevated house (which are common in Florida) and then they find a gap under the house, and crawl up. They crawl up walls, and very often they find a gap by the water drainage pipe of a first floor bathtub. They love to live in such an area. They also often die under the bathtub areas, and are a nightmare to remove. Often the first sign of opossums in our under a home is a flea infestation. The fleas can not only infest pets and bite humans, but spread various disease. Furthermore, when opossums live in an attic, they leave a whole lot of waste up there. Some attics are regular toilets, with hundreds of large, dog-sized droppings covering much of the attic. Opossums are not clean animals, and they poop everywhere. This contamination is not sanitary, and can cause health risks inside a home. Opossums are scavengers, and will eat anything they find, including rotting meat. They really seem to like pet food. If you leave pet food outside, opossums will find it. They will often threaten house pets to protect what they consider their food supply. Sometimes opossums will simply live under a shed or deck, and raid nearby garbage, fruit trees, and such.